The first thing we are taught to do with a glass of wine is to look at it. The second thing is to smell it, and only after we smell it do we tip the glass to taste the wine, though I do realize when you are thirsty, you might go right to step three! Which is the most important step? You might be tempted to say taste, but consider this: the taste buds on our tongues can only perceive five basic tastes: sweet, sour, salty, bitter and that elusive savory quality called umami. In this course we explore what that means in your glass. Curious as to how this works? Pour a glass of wine, pinch your nose closed and taste the wine. Without your nose to help you, all you will detect is some sweetness (that’s the alcohol and the basic sweetness of the wine), sour (that’s the acidity) and maybe a little bitterness from tannin. 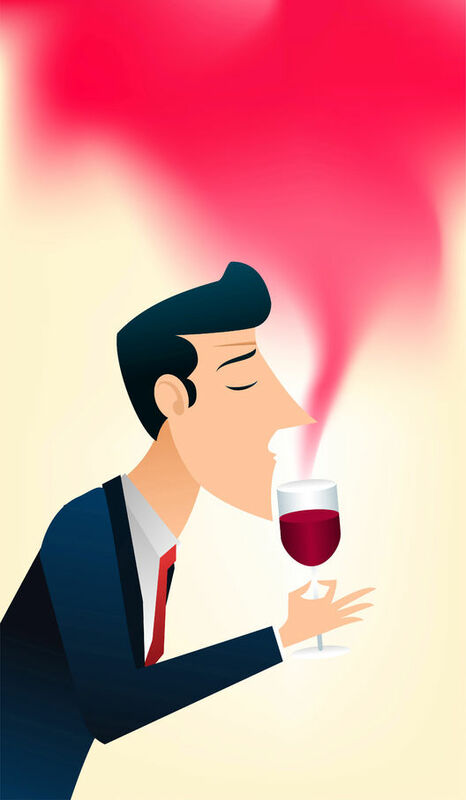 Now, stop pinching your nose and try tasting again – all those other elements like fruitiness, floral notes, spice…everything comes out in your wine, but only when you allow your nose to help. We might say that the taste buds provide taste but the nose provides flavor. In other words, the nose knows. At Fine Vintage, Ltd. we have a powerful commitment to enhancing your ability to taste and that means honing your skill at coordinating both taste and flavor, both the sensory impression from your taste buds and from your sense of smell. That’s where this exciting sensory masterclass comes into play. This 2-day course covers 14 classic grape varietals and the flavor/aroma profiles associated with them. For each grape variety, you will be provided with a selection of 3 to 5 strips dipped in pure aromatic essences commonly associated with that grape. You will smell each element individually, and they experience how they work together. We will coach you in developing techniques for identifying the aromatic characters individually and together. The most common comment I hear from those who attend a sensory course is that, "it is life changing." That may seem hyperbole now, but once you have the experience, I think you will find the statement accurate! We are excited to present this unique course to wine lovers at every level of experience. If you are a relative novice in wine, this course sets you on a solid path to enhance your wine experience. If you are pursuing higher levels of wine education, this coaching is invaluable for expanding your detailed knowledge of important grape varieties and honing your tasting skills. You will be amazed how this course expands your vocabulary and understanding of wine and especially how it enhances your tasting skills. I can assure you, after taking this course your understanding, appreciation and perception of wine will be forever changed. For more information on the course, see my blog post about the program. The course is kept small so it's important to register as soon as you decide to take the course - once we reach the class capacity, we will only take names for a waitlist. To register use the button below to go the Fine Vintage, Ltd webpage listing the sensory course in the appropriate city. I'll be leading the Sensory Masterclass Chicago in December, with additional classes planned for Atlanta, Boston, Miami and New York in 2019! This is an amazing opportunity you will never forget. The Fine Vintage Sensory Masterclass is offered in Chicago on Saturday and Sunday, April 27 and 28, 2019 at our usual venue, City Winery on West Randolph Street. The course is two full days, 9:30am to 5:00pm with a one hour break for lunch each day (please note that while most of our Chicago classes begin at 9am, this one starts at 9:30am). There is no exam, just the increasing enjoyment of wine!